There aren’t many bands whose instrumentation features an 8-string guitar. Italian quartet Søndag, however, feature two eight-strong guitar players. Not that you should ever judge a band by its strings to guitars ratio. The band I saw to feature a quantity of guitars with additional strings were proggy muso posers who delivered a whole lot of tedious fretwanking but no real tunes – or riffs, for that matter. 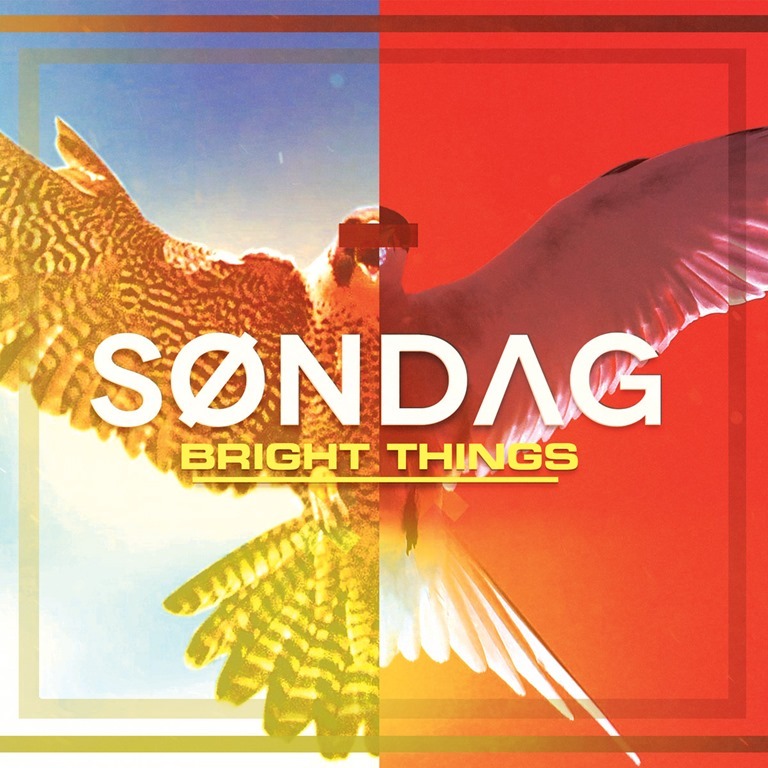 On Bright Things, Søndag bring the riffs – and tunes. The vocals may be clean, but the guitars are plenty dirty. According to the band’s biography, ‘the inspirations come from the need to mix very “low modern rock metal tunings” with something more dated, to form a blend of classical and contemporary rock sounds.’ It actually seems like a fair summary: Bright Things is a rock album, but the metal influences are clearly apparent, woven as they are deftly into the layered sonic cloth of each of the nine songs. The album was recorded and mixed by Riccardo Demarosi, and mastered by Alan Douches, who’s formerly engineered for bands including Converge, Mastodon, Swans, and Dillinger Escape Plan, and their input has been sympathetic to the band’s chunky dynamics. Opening track ‘Sweet’ begins with an atmospheric build before the guitars drive in. Yes, there’s a technically complex interloping lead guitar that’s heavily processed, but it’s pitched against a dense, gritty riff. There are hints of Oceansize in the arrangements on ‘Back in Town,’ but there’s nothing proggy about their concise and overtly rock-orientated songs, and the grungy ‘Polite Rebel’ brings a stomping beat to an unrepentantly unreconstituted slab of hard rock. I can’t help but think of Alice in Chains when listening to ‘Wax’. It’s in the harmonies. For the most part, though, Soundgarden and Baroness are perhaps more obvious comparisons. ‘Spitfire’ boasts some sinewy guitars with a searing afterburn, sparking across a tense and low-slung snaking bassline that spits and snarls and registers somewhere around the pelvis. Expansive and ambitious in sound, but focused and striking an appealing balance between sonic density and melody, Bright Things is far from lightweight or flimsy, but at the same time, it’s accessible and has hooks by the shedload. While they’re yet to make an impression UK, given the touring schedule which has seen them make inroads into mainland Europe, it’s surely a matter of when, rather than if.